The Yellow Vest protests have so far attracted only a handful of people in Ottawa every Saturday and might very well be the most poorly attended in all Canada if we go by a participant-to-population ratio. As such it wouldn’t deserve too much attention, but the fact that Ottawa is set to be the goal destination of the much-anticipated truck convoy in support of the oil and gas industry made the local yellow vest organizers feel particularly important and led them to take on local logistical work. This includes opening negotiations with the police, which has turned out to be an incredible mess. 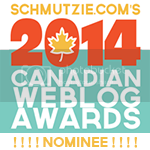 Before going into this, here is a little context about the Ottawa organizers. 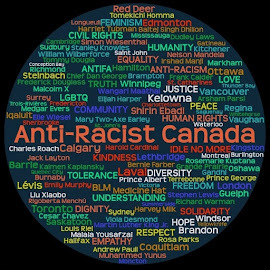 A handful of people can be singled out as organizers, and unsurprisingly they mostly hail from the same small group of people who were involved in anti-immigration and anti-Muslim rallies over the last year. Notably, most people who were regulars at these rallies have been absent lately, including individuals who were associated to the Proud Boys, Northern Guard, Soldiers of Odin and the Christian Heritage Party. 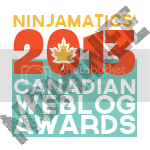 The following people have mostly taken up the slack. 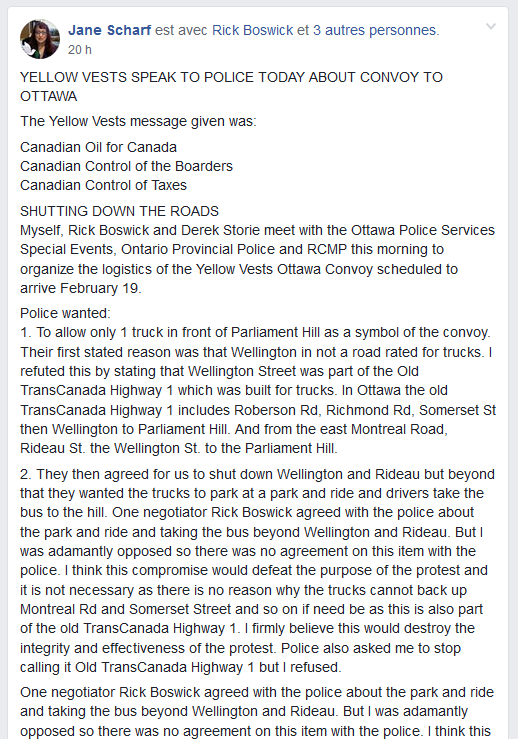 The camera team made up of Rick Boswick and Derek Storie were seemingly the first to jump on the yellow vest bandwagon, envisioning potential for making their anti-immigration movement more mainstream. It has been Boswick’s strategy to latch on to any movement that seems to be getting attention; for example he tried to start a “Free Tommy Ottawa” group and held a couple small rallies in support of Tommy Robinson last summer before that thing fizzled out. He latched on to the UN migration pact when that became trendy on the far-right, and now he’s wearing a yellow and can’t contain his excitement about the upcoming (?) truck convoy. His new buddy Derek Storie is also a camera guy, who accompanied him last fall when they both stayed at Kevin Johnston’s place in Mississauga to help in his mayoral campaign. Mitch Mercier joined Boswick and Storie around the time of the UN migration pact thing, and has been loyally accompanying them to their events since. He had the bad luck of getting his tires slashed when the gang went to attend a rally in Kingston in December, forcing the trio to return to Ottawa late at night. Guy Annable was known previously for attending Islamophobe rallies, and also for his vicious attempts to disrupt a pop-up injection site in Lowertown in Ottawa, from where he falsely claimed to be a resident. Finally, Jane Scharf seemed to be a new fixture to these rallies. She created her own “Yellow Vests Ottawa” Facebook group, from which she attempted to assert leadership over Ottawa rallies. She was previously somewhat known locally as an anti-poverty advocate who went through two fringe mayoral runs. Somehow she eventually became more conservative, and embraced anti-immigrant, pro-oil industry policies. These individuals got together and were able to rally as many as five or six other people to attend their “rallies” on Parliament Hill every Saturday. 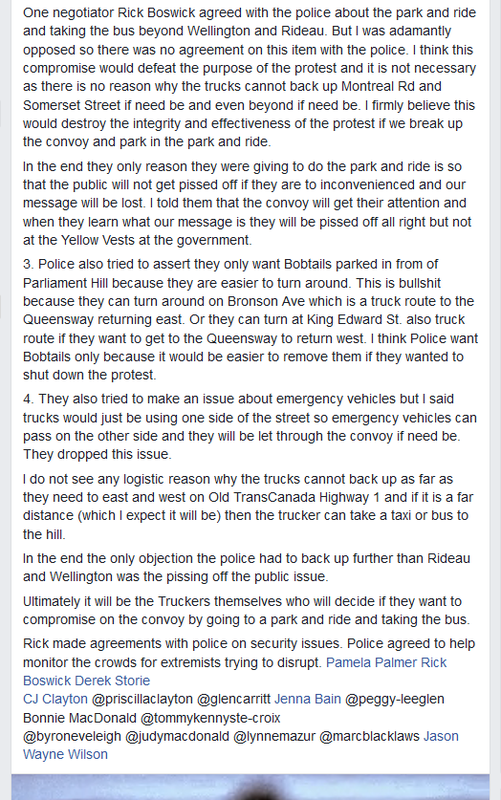 While this was going on, Boswick and Storie were networking with truck convoy organizers from the West, particularly the group around CJ Clayton who was later denounced as a scam artist by the rival truck convoy organizers. Boswick and his gang wanted to take on organizing the Ottawa logistics of welcoming the convoy, which led them to engage the local police forces to negotiate the entry of a large number of trucks in the Ottawa downtown. Scharf got involved in this organizing, and it seems like the group went ahead with engaging the Ottawa police without much of a plan, because things quickly fell apart as you can see in Scharf’s report-back (now deleted on Facebook) of the meeting, which is worth reading in full. 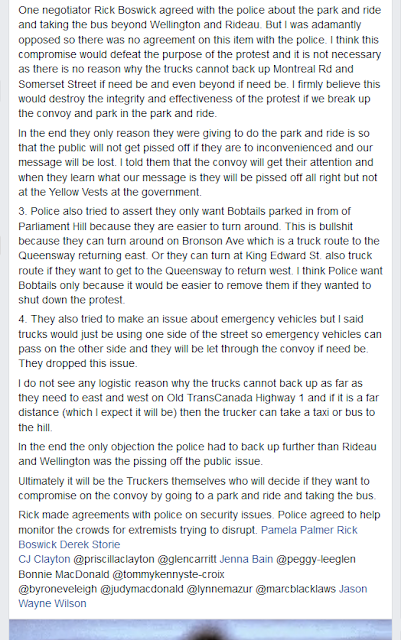 It seems like Boswick quickly conceded to the police’s plans for how the rally should go ahead, including a “park-and-ride” proposal which would severely de-escalate the planned shutdown of downtown envisioned by the original convoy organizers. Within the same day, Boswick and others were quick to fight back, accusing Scharf and her friend of personalizing the yellow vest movement and derailing their efforts. The unity of the little group was left in shambles. It’s hard to tell where things will go from here, since the small Ottawa group will play an overall very limited role in the truck convoy movement, whose main challenge will be getting on the road and actually reaching Ottawa in significant numbers. But the mistakes made by the Ottawa team will certainly not be encouraging to a movement that’s already struggling with internal divisions.